Today Facebook launched a new suite of developer tools which enable third party developers to easily interact with Facebook data. In my opinion the coolest feature they launched was a universal "Like" button that can easily be added to your wesbite. 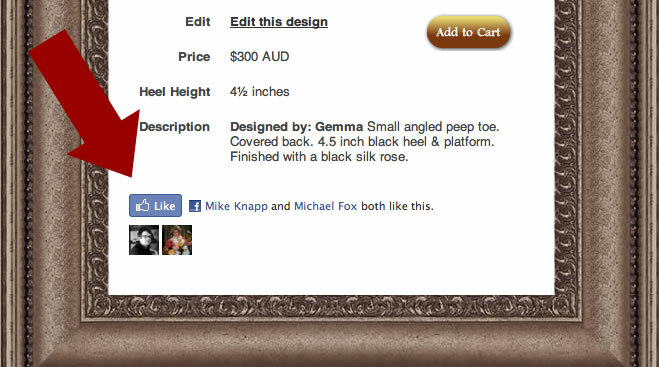 It actually didn't take us long to implement this feature on all of our shoe design pages on Shoes of Prey. Here's an example you can try out. When a visitor to your website clicks the "Like" button on your website, a news story is instantly posted on their Facebook wall. As a developer you can customize this news story through special meta tags that are placed on the same page as the like button. There is also a new analytics feature that allows you to see what URLs people are sharing on your site. The code to get this working is quite trivial - and could be implemented by anyone with a basic knowledge of HTML. You can find the instructions here. The new API is worth a look too, if only because it seems cleaner and better documented than their old one. What does this all mean? Well, for a start, I'm excited by the prospect of very easily allowing our users to interact with Facebook. It will make our site more visible on Facebook which should mean Facebook continues to be a strong source of traffic for us. More broadly it strengthens Facebook's offering to businesses. Clearly they are trying to insert themselves directly between their users and businesses. I wonder at what point they will transition to charging for this service. Probably sooner rather than later if only because it will a decent filter for silly/inconsequently content. Too much of that, and people will stop using Facebook. Alternatively, if "likes" never see the light of day either users will stop clicking on the button, or publishers will simply remove them completely. It's also going to be interesting to see what Facebook does with all of this data. An obvious application would be to provide personalized content recommendations based on your history. If you've implemented some of the new features on your site, let us know how you are using them in the comments below. that has got HUGE potential!! I think it's a fabulous feature and I'm keen to see how it helps to get people interacting with my content. Certainly, it's a better option than a comment box because sometimes people read but don't have time to write a comment. A quick click of the like button and they have registered their interest without killing their time budget. It totally supports quality content creation as the new traffic driver. Film a customer in store, get their email address, put it on Youtube, host it directly on your site (I use a video theme for wordpress), send them an email link, ask them to 'like it' (and most people do, seeing themselves on film) and bang you cross into their personal network.. 2 of their friends also like and bang bang.. 2 more network jumps..